The Center City trolley tour takes guests through the Avenue of the Arts, City Hall, Old City, Spring Garden, Chinatown, and more. See Philadelphia's most iconic murals in addition to City landmark attractions. 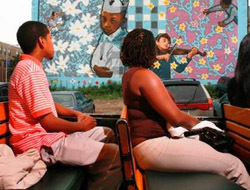 Experienced guides lead participants through Philadelphia’s diverse neighborhoods, providing an “off the beaten path,” behind-the-scenes look at some of the city’s 3,000 murals, including details on how they are made and the stories behind them. 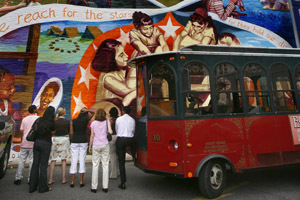 A mural arts trolley tour is a can’t-miss, uniquely Philadelphia, experience. Check-in at the Mural Arts Program booth located on the North End of the Visitor Center. Please check-in at the booth 15 minutes before departure. The antique trolleys are heated when necessary and have windows that open, but the trolleys do not have air conditioning. Photos courtesy of the Philadelphia Mural Arts Program.